The story of a family over many generations is put into an historical context. The first three chapters deal with very different communities in Germany: Creglingen, a rural community in Baden-Wuerttemberg; Fuerth, a city adjacent to Nuremberg which had a large Jewish population and important institutions; and Augsburg, where Jews, from 1438 until 1803, could not reside but lived in its suburb, Kriegshaber. The book interweaves the detail of the family's life with an explanation of the status and experience of Jews in Germany over the centuries, as well as the histories of the cities and towns from which the various branches of the family originated. The book is based on a combination of public sources, private sources, and interviews with local historians. Part II describes how the participation by family members in American professional, political, community, economic, philanthropic and family life is intertwined with the nature and locations where family members lived. It initially traces Hermann Obermayer's settling as an immigrant in Virginia, fighting for the Confederacy, living in frontier New Mexico, as a store owner in rural Illinois, and finally in business in Philadelphia. It also covers interesting experiences and travails of family members who lived in and near New York, Philadelphia, Washington, and Boston. This is based primarily on personal family records, many of which have been preserved for as long as 150 years. The book contains extensive photographs, charts, exhibits, indices and end notes, as well as 50 pages of genealogical reports. Additionally, there are appendices with English translations of a number of unusual religious wills, contracts, legal agreements, and permission requests during the period from 1618 to 1803, which have great contextual significance. After reviewing the book, Jonathan Sarna, Professor at Brandeis University, preeminent American Jewish historian and author of American Judaism, stated, "It taught me much that I did not know! 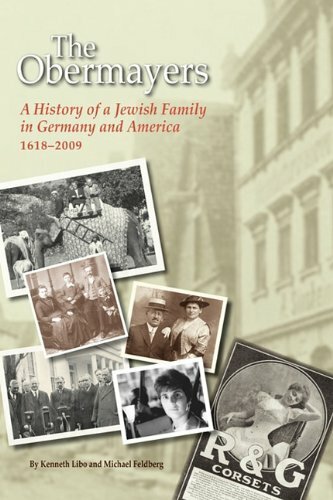 I hope that you will make copies available to major research libraries...historians will thank you for this well-researched and engaging portrait of a German Jewish family in two worlds." Karen Franklin, Co-chair, Board of Governors of JewishGen and former president, International Association of Jewish Genealogical Societies, commented as follows, "The Obermayers is one of the first books to place the varied experiences of Jewish families in a rich context of the sociology, history and economics of past life in southern Germany and the United States." Michael Feldberg is a historian and executive director of the George Washington Institute for Religious Freedom. He is a research faculty associate at the Center for American Political Studies at Harvard University. Published by Obermayer Foundation, Inc.